Chronic and debilitating back, neck, and leg pain affect many Americans every day. 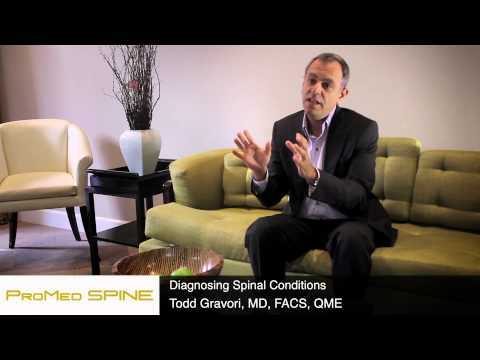 At ProMedSPINE in Beverly Hills, Dr. Gravori understands that this pain can be caused by a variety of underlying conditions. After performing a thorough consultation with each patient, Dr. Gravori determines which pain management treatment is best. Using the most innovative and minimally invasive techniques, Dr. Gravori helps alleviate pain and improve the quality of life for his patients. There are several pain management methods that Dr. Gravori can recommend to patients suffering from back, neck, and leg pain. Steroid Injections: Steroids can be used to effectively alleviate pain when injected into the problem area. The steroids typically provide immediate relief because they are delivered directly to the treatment site. Steroid injections are not a permanent pain management solution, but are a safe and reliable way to reduce the symptoms of back, neck, or leg pain. Lumbar Epidural: For spinal conditions that cause back and leg pain, Dr. Gravori can use lumbar epidural injections to provide pain relief. A lumbar epidural consists of a local anesthetic and a steroid, most commonly cortisone. Together, this combination is injected into the area that surrounds the spinal cord and nerve roots called the epidural space. Once injected, the lumbar epidural reduces inflammation and pain. Lumbar epidurals are not safe for everyone, so it’s best to consult with board-certified spine surgeon Dr. Gravori to determine the most ideal treatment for you. Nerve Blocks: Before pursuing surgery as a treatment option for back or neck pain, Dr. Gravori may recommend nerve blocks. Nerve blocks can reduce neck and back pain temporarily or long-term, depending on the treatment. A nerve block consists of injecting a medication into the treatment area that essentially blocks nerve signals that cause pain. Different types of nerve pain can be utilized to treat conditions such as spinal cord compression and nerve damage. Spinal Decompression: When the nerves and spinal cord become compressed, it can produce very painful situation. When patients experience the common symptoms of spinal compression, they should seek medical attention as soon as possible. If the condition is unresponsive to non-surgical treatment methods, Dr. Gravori may suggest spinal decompression surgery. There are several types of spinal decompression surgeries that Dr. Gravori can perform, and the most ideal treatment is determined after a thorough consultation. Disc Replacement: As we age, our spinal discs are prone to becoming weak and worn. When disc degeneration starts to cause pain and discomfort, a new artificial disc can be implanted when non-surgical options have failed to treat the symptoms. Disc replacement surgery allows patients to enjoy a quicker recovery than with traditional spinal fusion surgery. Schedule a Pain Management Consultation in Beverly Hills Today! As an expert spine and neurosurgeon, Dr. Gravori is highly trained and experienced in performing the safest and most effective pain management techniques. At ProMedSPINE in Beverly Hills, patients can trust that they will receive the best quality care available. If you are tired of living with chronic pain and discomfort, call Dr. Gravori at 888-75-SPINE today! Next, read Why Should I Seek A Second Opinion? Why Should I Seek a Second Opinion? ARE YOU READY TO LIVE WITHOUT PAIN? disorders, conditions and or treatment options. We hope the information will be useful for you to become more educated about your health care decisions.